The TE 90 Multi-Station Reciprocating Tribometer is a modular machine providing features drawn from a range of established test machines including the TE 77 High Frequency Friction Machine, the TE 80 Fuel Lubricity Tester and the TE 57 Pressurized Lubricity Tester. 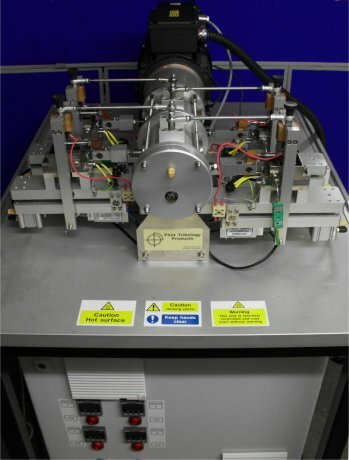 Single station multi-function and multi-range test machines may be able to perform a wide variety of different tests, but they can still only perform one experiment at a time. Simpler multi-station test rigs can provide a means for increasing test capacity at a substantially lower cost per test station than the single station solution. The TE 90 is a two, four, eight or twelve station reciprocating tribometer with test stations configured to meet a range of standard reciprocating test applications. 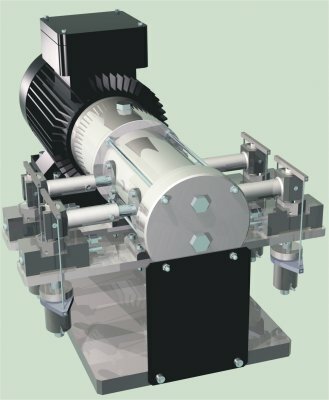 The reciprocating drive assembly incorporates a splined shaft and two eccentric cams, each driving a scotch yoke assembly. The cams are arranged 180 degrees out of phase, so that primary balancing of the reciprocating assembly is achieved. The assembly is a fixed stroke device with the stroke length dependent on the eccentricity of the cams. Cams for strokes of up to a maximum of 10 mm may be accommodated. Moving specimen carriers are attached to one or both sides of each scotch yoke. 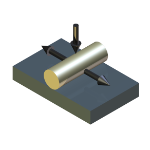 A single reciprocating assembly thus provides the basis for a two or four station test machine. 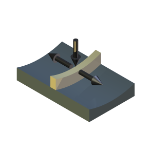 In order to create eight, twelve or indeed higher numbers of test stations reciprocating assemblies may be attached together in series on a common splined shaft. Four types of test assembly are currently available, each based on both existing tribometers and existing test standards. Purpose: To run tests under conditions specified in ASTM D 6079 Standard Test Method for Evaluating Lubricity of Diesel Fuels by the High-Frequency Reciprocating Rig. To run tests under conditions specified in ISO 12156 Assessment of Lubricity using the High Frequency Reciprocating Rig. To run reciprocating wear tests with point contact at moderate temperatures and light loads. Note: The TE 90 Fuel Lubricity Tester will run tests in accordance with the test parameters specified in ISO 12156-1 and ASTM D6079 fuel lubricity test standards and will rank fluids in the same order, but will consistently produce larger wear scars than the PCS HFRR instrument and a wider discrimination between low and high reference fuels. Purpose: To run tests under conditions specified in ASTM D 6079 Standard Test Method for Evaluating Lubricity of Diesel Fuels by the High-Frequency Reciprocating Rig (HFRR) under pressurized conditions. To run reciprocating wear tests with point contact at moderate temperatures and light loads under pressurized conditions. Purpose: To run tests under conditions specified in ASTM G 133 Standard Test Method for Linearly Reciprocating Ball on Flat Sliding Wear. To run test under conditions specified in ASTM G181 Standard Practice for Conducting Tests on Piston Ring and Cylinder Liner Materials under Lubricated Conditions. To run tests under conditions specified in Draft prEN1071-12 Methods of Test for Ceramic Coatings – Part 12 – Reciprocating Wear Test. To run standard reciprocating tests with point or line contact at elevated temperatures and varying loads. To run standard reciprocating tests with point contact at elevated temperatures and varying loads. Manual control of master test station load by precision regulator, with resulting master test station load measured by force transducer. Slave test station cylinder connected in parallel to master test station with no slave test station load measurement. 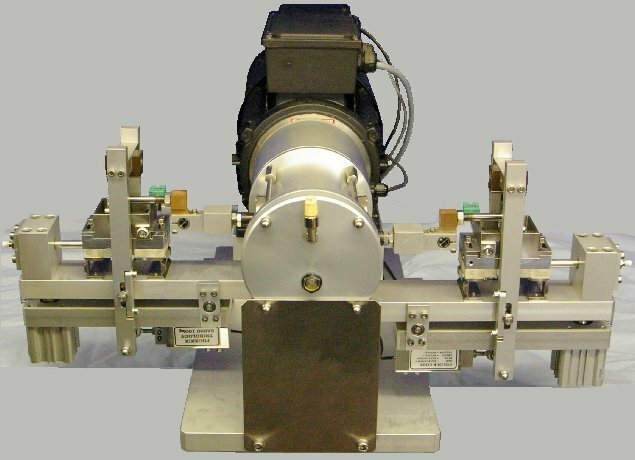 Manual control of both test station loads by independent precision regulators, with resulting test station loads measured by force transducers. Automatic control of master test station load by servo valve with force transducer feedback. Slave test station cylinder connected in parallel to master test station with no slave test station load measurement. Automatic control of both test station loads by independent servo valves, each with force transducer feedback. 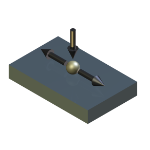 Manual control of test station loads by independent precision regulators, with resulting test station loads measured by force transducers. Automatic control of master test station load by servo valve with force transducer feedback. Slave test station cylinders connected in parallel to master test station with no slave test station load measurement. Automatic control of test station loads by independent servo valves, each with force transducer feedback. Note: Pressurized fluid supply system not included.